Suddenly everybody is an expert on the Liberal Democrats. Among the weirdest outcomes of this years political convulsions has been the transformation of previously disinterested commentators into self-appointed emissaries from planet yellow, explaining the every move and thought of the party in coalition. The tool of analysis which most of these sages have settled for their chin-stroking is that of the 'Orange Bookers' v the 'Social Democrats'. They inform us that the Lib Dems are led by economic liberals 'at odds' with the social democratic 'grass roots' or 'old guard'. This enables them to explain the history of the coalition as a product of this divide: Clegg was always 'instinctively closer' to Cameron than Brown; the two are "bound by their shared hostility to the state" (Steve Richards); "Just as much as Blair and Cameron, Clegg aims to replace British social democracy with a version of Thatcher’s market-based settlement" (Jon Gray). Even Andrew Adonis recently echoed such a view. But this is misguided. There are differences in outlook, of course, but the party doesn't factionalise along these ideological lines. The Lib Dems who have rebelled most so far are hardly left-wing ideologues and it's simply not true that the leading lights of the party share a centre-right ideology. It's more complex than that. Chris Huhne, for instance, wrote Reinventing the State, the book frequently touted as the ying to the Orange Book's yang, while Cable comes from a Labour background and he and Clegg devised for the party a whole host of policies (on tax, inequality, banks etc.) which can scarcely be called Blairite. More to the point, the 'Orange book' analysis obscures the main driver of Lib Dem behaviour since 6th May: fear. Fear of another election, fear that the coalition will fall apart, fear of electoral decimation at the hands of the Tories. 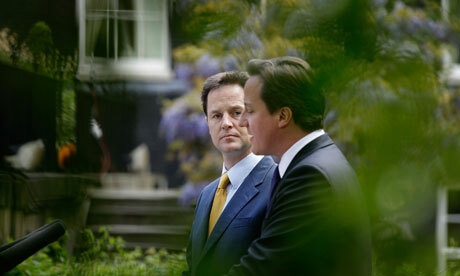 Most detailed histories written of the Coalition so far suggest it itself was conceived in fear. During negotiations and after, Cameron held up (explicitly and implicitly) the threat of a snap second election in autumn should the Tories be forced into minority government. There's a good chance this would have allowed them to blame Lib Dems for the preceding 'muddle' and turbulence, campaign for a majority and wipe many of the already fragile marginals the Lib Dems hold off the map. It seems the fear of this, with a deal with Labour not viable, is primarily what drove Clegg to lock himself and his party so firmly into a five year coalition, rather than any 'confidence and supply' arrangement. The trouble the party is now facing, is that this logic is now perpetuating itself over and over again and it is spiralling the Lib Dems into electoral oblivion. Fear that the coalition will collapse and of the resultant election seems to be playing a significant part in justifying faithful parroting of the Tory line, word for word, on almost every issue. This has lead to the Lib Dems being almost indistinguishable from the Tories, and seen the party's poll ratings plummet. Yet, ironically, the more the polls sink the more the logic justifies itself, as by implication the worse the election performance would be. This is a large part of the architecture of the Lib Dems own 'There is No Alternative' narrative on the coalition. It's a dangerous gamble, based on the premise that if the economy recovers, by 2014-2015 the Lib Dems will be rewarded in the polls. But polling since May has already shown cuts and fees have punished the Lib Dems disproportionately to the Tories. So if Tory/Lib Dem poll ratings and electoral performance are not fixed to each other, then neither should the Lib Dem and Tory line. While not being an expert myself, I'd say it's been fairly obvious from the start that the main way the Lib Dems can succeed in coalition is by being seen to sand down the edges of Tory extremism and carrying, as far as possible, the 'equidistance' ethos of opposition into government. But their current approach of hugging the Tory line close from the beggining militates against this, limiting Lib Dem influence and hamstringing the party's ability to promote any genuine concessions. Take higher education reform as a case in point. The Browne review reccomended lifting the cap on fees. But that day, Cables support for the review was full throated. It was Cameron, then Willetts, that signalled the row-back and eventually the retention of a cap. This should have been the other way around! The Lib Dems initial echoing of the Tory line left them no room to sieze on improvement to Browne. If they had taken a step back, staked their opening position a little more carefully, briefed their opposition a little more openly, put their name to row-backs, they could possibly have limited the damage they are suffering on this issue now. At the very least, this approach provides a good template for other, less totemic, policy issues going forward. Instead, their actions suggest that behind closed doors the Lib Dem leadership is being bullied by the Tories and their spindoctors. Its probably also a case of Westminster politicians operating according to Westminster orthodoxy: difference equals 'splits', splits are bad. But the Lib Dem leadership needs to think outside this political box. Just hanging is not a strategy that will ensure the party's recovery. What is needed is at least a kind of 'ochestrated disagreement'. Clegg and co need to argue for room to be seen to disagree from the beggining on certain issues, to be seen to force concessions and claim them as their own – school sport presents the latest opportunity. They need the spirit of their coalition negotiations within government, to openly define themselves as much against the Tory right as Labour. This would give them a platform to build on for the 2015 election, wheras on present course it's difficult to imagine how they could forge one. The leadership should argue with Coulson and Cameron the need for flexibility in this respect – there is no reason if they are aware of this strategy that it will break the coalition. Moreover, the Tories own poll ratings are worsening and there's no guarantee they themselves would fancy their chances in a snap election. The Lib Dems may have more room for manoeuvre than they think in this Coalition- but if they don't start to properly use it, they'll continue to lose it.